Proprietary Name: Rite Aid Severe Toothache And Gum Relief Triple Medicated What is the Proprietary Name? Rite Aid Severe Toothache And Gum Relief Triple Medicated with NDC 11822-6037 is a a human over the counter drug product labeled by Rite Aid. 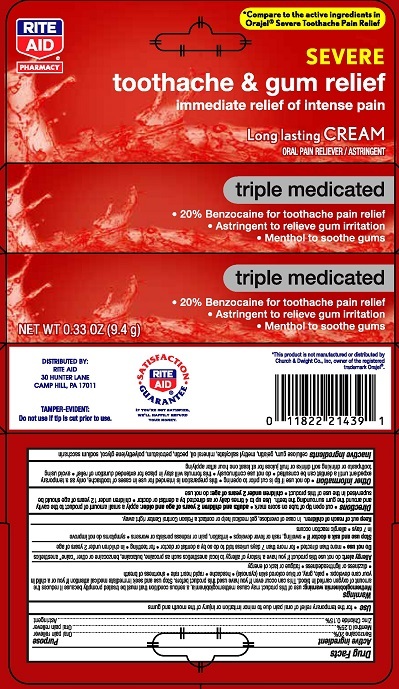 The generic name of Rite Aid Severe Toothache And Gum Relief Triple Medicated is benzocaine, menthol, zinc chloride. The product's dosage form is cream and is administered via topical form. DISTRIBUTED BY:RITE AID30 HUNTER LANECAMP HILL, PA 17011TAMPER EVIDENT: Carton is sealed for your protection.